The question of how people can live and work together well on a mission to Mars may turn out to be one of the biggest challenges of deep-space exploration. To simulate the experience of a crew stuck inside cramped quarters under stressful conditions, a nonprofit is planning a one-year mock Mars mission in the Arctic. The mission, to begin in July 2014, is being planned by the Mars Society, an organization dedicated to manned exploration of the Red Planet. 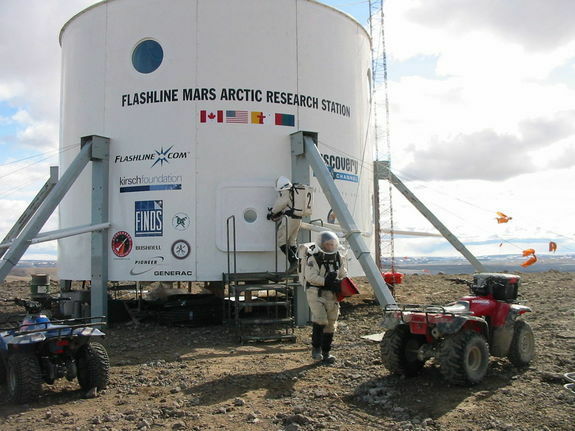 Six crew members will spend a full year living inside the Flashline Mars Arctic Research Station (FMARS), a 25-foot-tall (7.6 meters), 27-foot-wide (8.3 m) cylindrical habitat on Devon Island in the high-latitude Canadian Arctic. Situated at 75 degrees north, roughly 900 miles from the North Pole, Flashline Mars Arctic Research Station is located adjacent to a 20 kilometer meteor impact crater in the midst of a polar desert that is known to represent one of the most Mars-like environments on Earth. "The duration, the harsh environment, actually doing the same activities as a Mars crew — this combination hasn't been done before," said Joe Palaia, FMARS director and crew commander of a monthlong mock Mars mission planned for the facility this summer. The July 2014 mission, which is estimated to cost up to $1 million, will aim to provide valuable data to help the planners of the first real-life trip to Mars choose a leadership structure and promote healthy social interactions among the crew. Under directions from the Obama administration, NASA is aiming to send people to the vicinity of Mars in the 2030s, with a landing on the Red Planet to follow. "The issue with human factors is not, 'Will people go crazy if they are isolated for two years?' — that's a science-fiction script," said Mars Society president Robert Zubrin. "Average people are capable of handling a year of isolation very well," he added, citing real-life situations of prisoners and people in hiding, such as Anne Frank and her family in the Netherlands during World War II. "The relevant issue is, do people hold together, is their morale sustained, are they able to keep working together well to accomplish mission objectives? Are they too depressed, are they arguing? Those are the issues that are of interest." Collecting reliable data about these questions, though, requires mission conditions as close as possible to those at a Martian settlement. Zubrin said the project's findings could prove more useful than those of other mock Mars missions, such as the Mars 500 simulation — a year-and-a-half-long mission conducted in a laboratory module in Moscow that ended in November 2011. "There's some useful data from that, but they're not under any real mission stress," Zubrin told SPACE.com. "They're in a nice, comfortable room, basically not having to do anything. It's like being on house arrest." The Mars Society mission will also offer a chance to test out what equipment and technologies might be best for the kind of work being conducted on Mars. "Before you go and spend a billion dollars designing a ground vehicle to operate on Mars that will run on some exotic power system, you want to find out what is the right type of ground vehicle," Zubrin said. "Should it be roving habitats, single-seaters — what should it be? In engineering, designing things right is important, but even more important is designing the right thing. This will help with that." This scenario depicts crew members checking their equipment during a simulated EVA. The Mars Society is planning to recruit six crew members for the mission, including at least two with a natural-science background, such as a geologist and a microbiologist, as well as two "handy" people who are talented at fixing mechanical and electrical systems, as well as software. At least one crew member must have medical training, and another crew member will be the mission's "journalist" — a person to keep a detailed journal of everything that happens during the expedition. Finally, the crew will need a leader. "We have to have someone in the crew who has the maturity, balance, judgment and levelheadedness to be in command," Zubrin said. "Not like [Star Trek's] Picard, who just sits in his chair and says, 'Make it so.'" To raise money for the operation, the Mars Society has launched a crowdfunding campaign on Crowdtilt. Follow Clara Moskowitz on Twitter and Google+. Follow us @Spacedotcom, Facebook and Google+. Original article on SPACE.com. Curiosity snaps the first color view of the north wall and rim of Gale Crater, where NASA's Mars rover landed Sunday night. The picture was taken by the rover's camera at the end of its stowed robotic arm and appears fuzzy because of dust on the camera's cover.